Hello! Long time no see! I've had a rather disastrous first six months of the year and am only now starting to feel like I have the energy to work on any kind of comics at all. There's a single new update coming on July 13, just as a sign of life from me. However, if you want to see this update now, you can go to my Patreon and become a Patron in the $1 tier! It's already live there. I'm also posting a revised version of the Chronicles of the Witch Queen story Courtly Manners 2: The Unicorn Race starting today. This will show up on the Chronicles of the Witch Queen website starting July 14, but paying Patrons get early access and larger files (downloadable only, I'm afraid. Patreon's interface does not allow for clickable images that can be embiggened as far as I can tell). There will be more early-access and exclusive content coming soon. However, the comics will always be available online for free through their respective websites, this one, Spun Off, Abúi's Travels. Chronicles of the Witch Queen and The Lives of X!Gloop. But the more Patrons I get, the better I will be able to produce comics regularly. So please join my Patreon and pledge a dollar a month! This isn't going to mean much to readers outside a tiny corner of Western Europe, but I have spent a lot of time thinking of the work of the late Dutch cartoonist Peter De Smet, because his best-known series, De Generaal, is getting reprinted this year after being unavailable for many years. 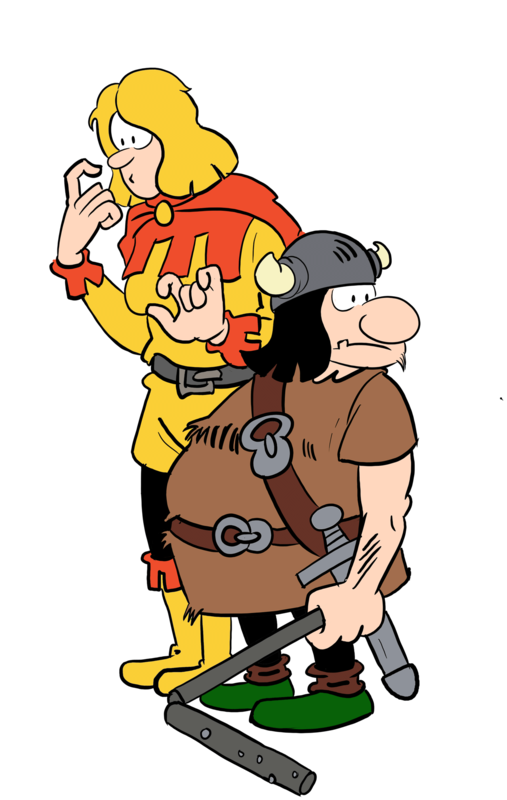 Before starting De Generaal, De Smet made a fantasy adventure comic in a broadly, generically medieval setting, called Joris P.K. and it struck me that that comic influenced early Rogues of Clwyd-Rhan more than I'd previously acknowledged. So the idea of drawing Ragnarok and Tamlin in the style of Joris P.K. and his sidekick Plok the reformed pirate popped up in my head, as did a wild notion that I might draw them like that in a story to add to the very beginning of the archives, set before The Green Knight's Belt. There's no way of knowing, given the pile of unfinished and unstarted projects already on my desk, if this story will ever get made, but the single drawing at least is here! It's pretty much like what I had in my mind. In case you're curious, the existing ROCR archives do have one story where the debt of inspiration from Peter de Smet's work is obvious (to me) and explicit: the Headsmen storyline riffs on tropes from De Generaal in several places and a Dutch reader of a certain age would recognize those. January was dedicated to portrait art, like January 2018 will be again. I drew 19 portraits in total. This, of my friend Carlokas, is one of the best from that challenge. Carlokas’s selfie game is ON POINT as are his smoldering looks. February was an entirely unproductive month in which I drew two quick sketches. This, for a planned new White House In Orbit project, was one. Geir and I are both keen to bring this comic back after a decade and a half, but Geir is not well and neither of us have time and energy to give this the attention it deserves. Story of our lives, really. March was another month that wasn’t very productive but I did a bit of work on Abúi’s Travels, inching that comic closer to completion. Later in the year, I did a side quest for that in about 15 quickly-drawn pages which are not featured in this overview. In April, things picked up dramatically. Among other things, I finished a page for The Lives of X!Gloop that I had started in late 2015. Or was it 1993? In any case, it got its final form and actually looked pretty good. More unfinished business got worked on in May as I redrew parts of the Rogues of Clwyd-Rhan storyline Feral. I would do quite a bit of work on that between May and November, turning ugly pages into pretty ones and redrawing a long sequence to improve stylistic consistency. June and July were months in which I worked super-hard to update regularly. In fact, across all of my comics that are currently active, I updated daily during July. I would like to do that again as it got a lot of stuff out of the way. Pages shown are both from Lives of X!Gloop. I did, however, rebound from that productivity in August, when I should have been working on Rogues of Clwyd-Rhan but couldn’t find the motivation and drive. The day job was also picking up (the summer became known as the Summer of Horror at the office as people had scheduled vacation in the summer to make up for overtime, pushing whoever was still working into further overtime. This was eventually fixed with large cash payouts of overtime worked, but we’re still short on staff). I spent some time doing character art for a near-future SF/Jungle Girl comic called Fury of the Plains which I hope to do some actual pages for this year. The day job situation continued throughout September and October, pushing comic work into the weekends. I did manage to redraw 16 pages of Rogues of Clwyd-Rhan before my productivity crashed entirely in November. One unfinished Rogues of Clwyd-Rhan page was all I produced that month before taking a break to take care of personal business. December was Decemboobs​ month for the third time. It’s a month-long-daily challenge for cartoonists and other groups of artists with a history of, shall we say, difficulty drawing human breasts convincingly, to draw them from reference, either from photo reference or from life. I did mostly traditional pencil art, but switched to digital late in the month. One model, Yournudemom​, was the subject for five different drawings that month and so she’s featured here as well. I made 28 drawings in total, which is a record for me. I’m not sure I made as much progress during the year as I wanted to, or as much as I felt like I was making at the time. Restoring productivity was the name of the game for much of the time. That worked! I added a lot of updates to my webcomic sites and had a lot of fun doing so. And in December, I gained a lot of new viewers on Tumblr especially. My last post in the blog said Rogues of Clwyd-Rhan was going on hiatus. I've been back for six months now, so it's past time to replace that post with something more up-to-date. And as it happens, I have a few things to say. First, I have a Patreon now. For the time being, all content posted on it will be free to everyone, but if you want to support me financially, the option is there. Also for the time being, it is set to a per-post charging system, and that means that if you become a Patron, the charge will kick in the first time I set a post to "Charge Patrons". I will give advance warning to that, and if enough people tell me that won't work, I will change it to a monthly model. You can also simply Follow me on there, which means you will receive information about what I post and about changes to the Patreon, but you won't be charged until you decide to pledge. What you will get for free on my Patreon (For the time being!) is more reposts of Feral, posted daily, with extra commentary if I have something meaningful to say. You see, unlike ComicFury's tiny Comments box, Patreon has this big inviting box for me to type into, and it means I will run my mouth. Later on, when I do start setting up pledge tiers and goals, these will contain things like early access to completely new pages (starting some time in 2018), behind-the-scenes art and writing, critical essays about webcomics (first few of those will be free so I can establish a track record) and opportunities to review and critique completely new work by me before anybody else. Higher tiers may also include things like "Become a character in the comic" if people are into that. Second, I've also been using the Rogues of Clwyd-Rhan Facebook page to connect with readers. There, you will find larger images of some panels used to promote new updates with, occasional prep-art and behind the scenes stuff. I would love to see you there! Third, a request for a favor. In the left column of each page of Rogues of Clwyd-Rhan on ComicFury, there's a button that says "Subscribe". Please use it, if you have an account on ComicFury. For those of you who wonder what exactly the button does: it adds the comic to a list of other comics on a special page of Your Subscribed Comics, and on that page, you can see which of your favorite comics have updated the latest. That's all it does; it does not send email notifications, make beeping noises or use your personal data, except in one way: it adds you to the count of subscribers for the comic. Now, the difference this makes for me is as follows: many readers on ComicFury use the ComicFury front page to explore new comics. The front page, if you're not familiar with it, shows several tabs full of comic icons with the number of updates and subscribers underneath it. For quite a few readers, one way they decide which comic to follow is by looking at the ratio of updates to subscribers, and if a comic has many updates but few subscribers, they may decide not to give it a chance. As it happens, the ratio for Rogues of Clwyd-Rhan is horrible! 37 subscribers for almost 1300 comics. I'm not ever going to manipulate or push people towards subscribing to Rogues of Clwyd-Rhan but I have been wondering if the ratio is worse than it would otherwise have been because I have more readers coming from outside the ComicFury system, and some of you may not know what the feature does for them. So, if you want to be conveniently alerted to new updates, or if you just want to make me look better in the eyes of people who don't know Rogues of Clwyd-Rhan, please subscribe. This does require a ComicFury account, but I assure you, they're good people. I'd pet them. I've come to a decision: after this run of fillers from 2005 ends, I will not re-run the unfinished storyline "Feral" here, and this re-run of the Rogues of Clwyd-Rhan comic on ComicFury will end. The reason is simple: I have made no progress on "Feral" since I started the re-run three years ago, and I now believe that on top of that, the storyline as it is needs major revisions, which rules out continuing for another 100 days or so with the material I've got. So the plan now is to leave this site dormant for a while until such time as I am able to first revise and continue the story. This may be a while yet as my day job and family life continue to keep me very busy. I hope everyone has enjoyed these (nearly) 1200 episodes and thanks in advance for your patience. "Feral" will get worked on eventually; I just don't know when.